29 Competition: Your chance to win a Chord Electronics Index in this month's competition. 51 World Standards: Brand new, updated guide to the latest and greatest hi-fi hardware on sale. 74 Subscriptions: Ensure your copy every month and save money too! 83, 85, 87, 89 Opinion: The team get to grips with matters music, hi-fi and life! 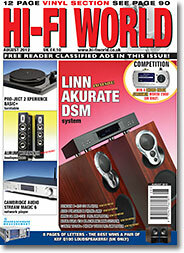 12 Linn Akurate System: A Linn system with their Akurate DSM preamp is reviewed by Noel Keywood. 20 Aurum Wotan VIII: German precision ribbon loudspeakers, by Noel Keywood. 39 Accolade Model1: A novel BMR equipped 'speaker get the attention of Paul Rigby and Noel Keywood. 24 Densen B-475: A top CD player is reviewed and admired by Paul Rigby. 42 Cambridge Audio Stream Magic 6: An advanced network player at a great price, used by Noel Keywood. 58 Epiphany EHP-02: Paul Rigby dons headphones to listen to this neat little product. 62 Metrum Octave DAC: Raphael Todes analyses this much admired DAC from Holland. 47 Celestiondittion15S: Haden Boardman on a great old loudspeaker, now available for �50 or so. 19 Tellurium Q Iridium: Rafael Todes gives his opinion on this novel S.E. Class A amplifier. 70 Ming DA MD7-SE Preamp: Tony Bolton warms to the sound of valves up front. 78 Blue Aura V30 Black Line: A neat valve mini system catches Paul Rigby's ear. 73 B&W P3 Headphones: Quality B&W headphones, reviewed by Paul Rigby. 92 Pro-Ject Xperence Basic+: Adam Smith spins vinyl and likes what he hears from the Basic+ turntable. 96 Avid Pulsare II Phono Amp: A balanced-input phono preamp impresses Paul Rigby. 101 Alignment Guages: Gauges for arm alignment rounded up by vinylista Tony Bolton. 107 Canortp 206+: An all-valve phono preamp is appreciated by Tony Bolton. 122 Classic Cuts: Paul Rigby listens to Gram Parsons The Early Years box set.